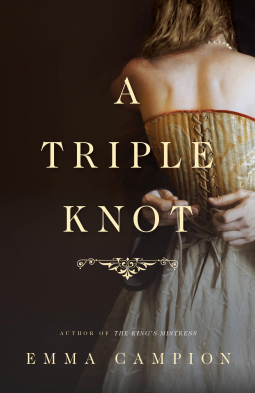 In A Triple Knot, author Emma Campion has successfully brought to life the early years of Joan Kent's life. Although the first two chapters of this novel were a little too heavy in backstory and the introduction of far too many names and characters, once I read past this slow beginning, the story started to build and truly captured my interest. The characters are majestically and realistically brought to life, as are the politics and court intrigues of King Edward III's court. Through clever dialogue and rich descriptions, Joan of Kent’s life takes center stage in a most compelling and believable way. Joan was recreated in an honorable way, showing either her great affection or great distate for her three husbands. Her plight as a pawn is poignant, especially when she risks all to follow her heart instead of her duty to England. And all this while she was in her early teens. Despite all the political minefields she must tread carefully through, Joan was a woman who remained true to herself. The author's depiction of Joan of Kent and those closest to her was nothing short of delightful. I highly recommend this novel!